Almost a year ago, Kenya Wildlife Service (KWS) rangers shot and killed Mohawk, one of only three mature male lions in Nairobi National Park, after he wandered outside park boundaries and found himself surrounded by a crowd of people. KWS was widely condemned for not being able to keep ‘their’ lions inside the park, for their rangers taking too long to reach the animal and finally for the choice to kill the lion instead of sedating and relocating it back into the park. The very next day, locals then speared another male lion, Lemek, reducing the 36 lions of Nairobi National Park by two in as many days. 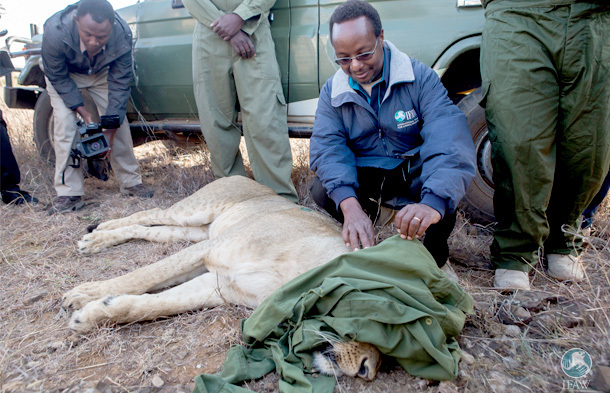 Amidst the loss of these two lions at the southern sections of the park, and straying of more lions at the north and eastern parts of the park (a phenomena not witnessed since the park was fenced in the latter areas), KWS scientists rapidly conducted a study of the happenings and compiled a report that provided concrete recommendations for mitigating and preventing the human-lion conflicts. One of these was to enhance the use of satellite technology to monitor the movements of the lions of Nairobi National Park. Two lions, Nelly and Kiprono, already had such satellite collars that provided useful information of their movements. However, the scientists also knew of other male lions and pride families whose movements were not well understood – and could be the ones that stray outside the park. KWS determined that six more lions had to be collared and camera traps needed to be stationed at strategic routes that animals use. With such real time tracking and monitoring, KWS would be in a position to deploy its rangers in a strategic manner so as to pre-empt and prevent conflicts with the lions. 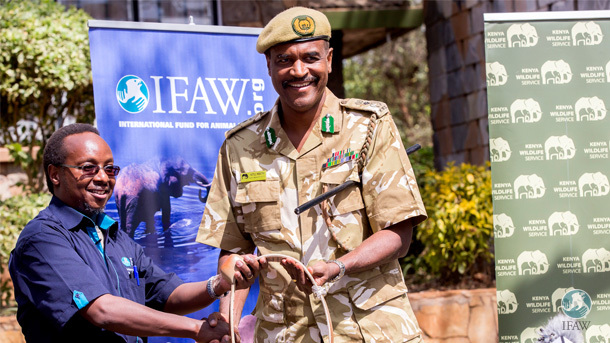 KWS approached IFAW in April 2016 to partner on this initiative, providing both animal and human welfare results. IFAW donated six satellite collars and 18 camera traps, and the first lion, Nyala, was successfully collared at Nairobi Park on the morning of 23 January. Such active management of the wildlife inside Nairobi National Park will only increase as development around the park increases to meet the needs of humans who are increasing at 1 million per year yet the land surface of Kenya remains the same. Is there hope for wildlife, especially wildlife next to the city of Nairobi? Yes we at IFAW believe there is hope. But it will mean having a different level of consciousness about our place in nature and smart land use planning to assure co-existence of both humans and wildlife.